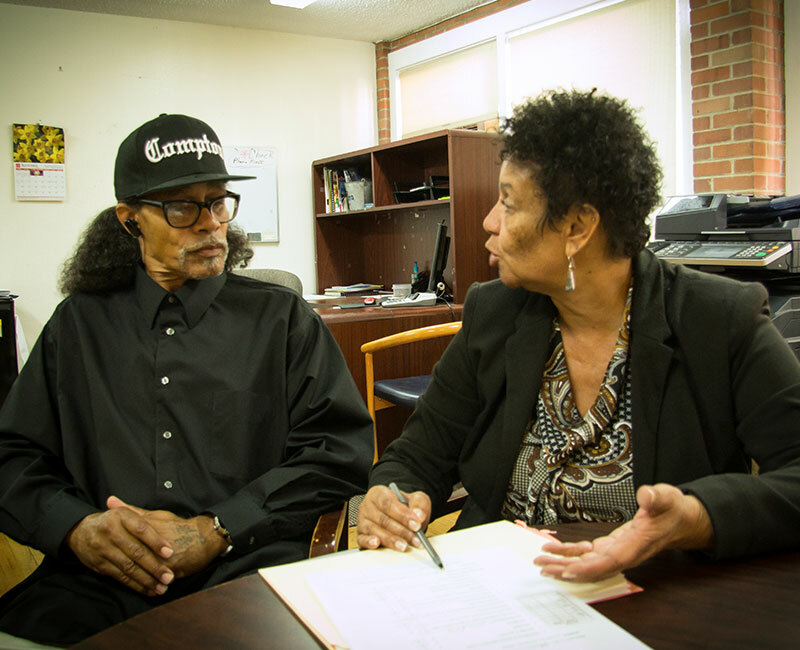 Participants in the Employment Services program come from St. Francis Center’s day shelter program, drug and alcohol programs, parole and corrections transition services, and other community organizations. Our program helps men and women develop skills, gain work experience, and connect with full-time employment. Services are designed to end the cycle of poverty and promote economic self-sufficiency. Because many of the men and women seeking jobs do not have job readiness skills, St. Francis Center will help them obtain basic skills and overcome barriers to employment opportunities. The employment program will help men and women learn how to effectively search for jobs, prepare resumes and job applications, and prepare for job interviews. St. Francis Center’s case managers will help participants overcome barriers to success by connecting prospective jobseekers with resources such as healthcare (medical, mental health, dental, vision), food, child care and housing; helping individuals obtain work clothing, work boots, tools, and legal identification; providing financial management and life skills trainings to provide additional support to participants. Employment staff meet individually with participants to develop a career profile and interests inventory, identify their interests in training, and match those skills and interests with appropriate training options. Highway Flagging Training- This training includes review and preparation for the Highway Flagging Proficiency Examination. When participants pass the exam with a score of 80% or higher, they receive their flagger certification. The course covers all aspects of Colorado Department of Transportation (CDOT) regulations and requirements for flaggers, including uniform, personal protective equipment, equipment set up, and safety. We will provide up to six flagger certification trainings annually. Customized Training- We will help men and women enroll in a number of off-site trainings with our partner agencies. Partnerships with Community College of Denver, Red Rocks Gateway Program, Emily Griffith Opportunity School, and private industry training providers will provide customized job training opportunities for our men and women. Participants will also receive help accessing training in areas such as computers and first aid that will improve their chances at obtaining a full-time job. We place men and women in employment opportunities. For those who are placed, we will provide bus tokens and bus passes to ensure that men and women can travel to their jobs. St. Francis Center employment staff will carry out job development with prospective employers. Participants will receive help preparing resumes and job applications, preparing for interviews, and searching for employment.